Modular Active Chilled Beams (MAC Beams), also known as induction diffusers, consist of: a beam module (which is very similar in size and shape to a lighting fixture), a pressurized plenum, a horizontally mounted coil which can be either: cool only, and/or heat/cool, and mounting brackets. MAC Beams use ventilation air (ï¿½primary airï¿½) under pressure (0.3ï¿½ w.c. ï¿½ 1.25ï¿½ w.c.) , to force room air to be re-circulated through a horizontally mounted coil within the chilled beam module." Incredible air side efficiency - Twa MAC Beams generally require only: 99 - 225 CFM/Ton of cooling. 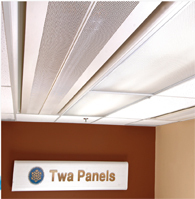 TWA no longer fabricates active beams for the US Market.